David Randini is one of the UK's top magical entertainers and is a highly regarded magician based in the Isle of Wight specialising in close up table magic, and performs magic at restaurants, balls, banquets, corporate events and functions, weddings, trade shows and any kind of celebration or event. David Randini has served a long apprenticeship under his father - The Great Randini. 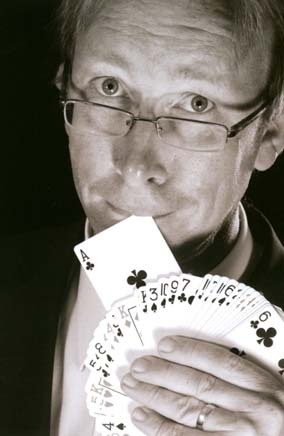 David has built up an unrivalled knowledge of magic and entertainment. David''s laid back style is personal and unobtrusive, yet leaves people with something they will remember for a long time. His engaging personality and honed people skills can be used to enhance any function, celebration or event. David Randini has studied magic in the United States of America and China and collects only the best and most entertaining magical effects from around the world. His parlour magic is ideal for after dinner speeches. A full time professional magician since 1986, David Randini has vast experience in almost every type of situation and can tailor his performance to suit your individual needs. David Randini has followed in the footsteps of his father with his specialised magic for children. Using basically his fathers routines with his own personality thousands of children have enjoyed his shows. David's Road Safety Presentation took five years in the planning and is a real winner. He has worked hard with his local traffic education department to come up with a presentation which is powerful, fun and informative. This is the jewel in David''s children''s entertainment in the UK and is highly recommended. When you book David Randini you are booking the person as well as the magician. It not just what you do it''s the way that you do it. From black tie dinners to your granny's birthday you can be assured that you are booking a professional who will enhance any occasion.